Uit een grote veiligheidsstudie met totaal 120 patienten met vergevorderde eierstokkanker blijkt dat alsnog immuuntherapie met het anti-PD medicijn Avelumab zin kan hebben. Enkele patienten, die allemaal zwaar waren voorbehandeld met enkele chemokuren (3 of meer) en / of parpremmers bereikten zelfs een complete remissie of een gedeeltelijke remissie van meer dan 50 procent. De helft reageerde positief met minimaal stabiele ziekte. Met acceptabele bijwerkingen want bij slechts 9 procent van de deelnemers traden graad 3 bijwerkingen op. Opvallend is dat weinig patienten een duidelijke PD-ligand mutatie hadden. Dus ook zonder een sterke mutatieload reageerden best veel patienten positief op de immuuntherapie. Echter de onderzoekers zeggen ook dat een combinatie met bv parpremmers en in een vroeger stadium van de ziekte waarschijnlijk betere resultaten zal geven. Daarvoor lopen al drie verschillende studies die zover ik goed ben geinformeerd ook door Nederlandse of Belgische patiënten aan kan worden meegedaan. Maar vraag dat uw behandelend arts uiteraard. Of zie de contactpersonen in de studieprotocollen. Two global phase 3 trials of avelumab in combination with chemotherapy have been initiated in patients with ovarian cancer. JAVELIN Ovarian 100 (NCT02718417) is a 3-arm trial comparing first-line carboplatin and paclitaxel chemotherapy given in combination with avelumab or given alone with or without avelumab maintenance therapy. 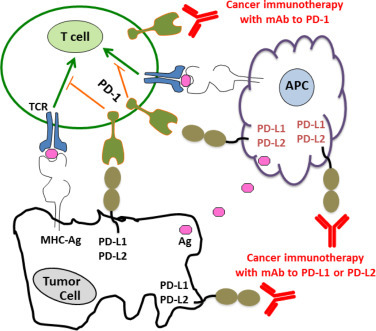 Several early-phase studies have been initiated combining anti–PD-1 and anti–PD-L1 antibodies with PARP inhibitors, including a phase 1b/2 trial, JAVELIN PARP Medley, which is enrolling a cohort of patients with recurrent platinum-sensitive ovarian cancer who will be treated with avelumab plus talazoparib (NCT03330405). Results from these ongoing studies will help to define an appropriate role for checkpoint inhibitors within the treatment of ovarian cancer. Omdat het volledige studierapport : Efficacy and Safety of Avelumab for Patients With Recurrent or Refractory Ovarian CancerPhase 1b Results From the JAVELIN Solid Tumor Trial gratis is in te zien met gedetailleerde grafieken en omschrijvingen hoe de studie is uitgevoerd enz. geef ik hier alleen het abstract met wel de uitleg in de discussie. Question Does avelumab have clinical activity in the treatment of recurrent or refractory ovarian cancer? Findings In this phase 1b cohort study, 125 patients with heavily pretreated ovarian cancer (median, 3 prior lines) received avelumab, 10 mg/kg, every 2 weeks. The objective response rate was 9.6%, complete response occurred in 1 patient (0.8%), the 1-year progression-free survival rate was 10.2%, median overall survival was 11.2 months, grade 3 or 4 treatment-related adverse events occurred in 7.2% of patients, and immune-related adverse events occurred in 16.8% of patients. Meaning Avelumab demonstrated antitumor activity and an acceptable safety profile in heavily pretreated patients with recurrent or refractory ovarian cancer. Importance Current treatment options for progressive ovarian cancer provide limited benefit, particularly in patients whose disease has become resistant to platinum-based chemotherapy. Objective To assess the efficacy and safety of avelumab, an anti–programmed death-ligand 1 agent, in a cohort of patients with previously treated recurrent or refractory ovarian cancer. Design, Setting, and Participants In an expansion cohort of a phase 1b, open-label study (JAVELIN Solid Tumor), 125 patients with advanced ovarian cancer who had received chemotherapy including a platinum agent were enrolled between November 6, 2013, and August 27, 2015. Statistical analysis was performed from December 31, 2016, to October 9, 2018. Intervention Patients received avelumab, 10 mg/kg, every 2 weeks until disease progression, unacceptable toxic effects, or withdrawal from the study. Main Outcomes and Measures Prespecified end points in this cohort included confirmed best overall response (per Response Evaluation Criteria In Solid Tumors, version 1.1), immune-related best overall response, duration of response, progression-free survival, overall survival, results of programmed death-ligand 1 expression–based analyses, and safety. Results A total of 125 women (median age, 62.0 years [range, 27-84 years]) who had received a median of 3 prior lines of treatment (range, 0-10) for advanced disease were enrolled in the study. Patients received avelumab for a median of 2.8 months (range, 0.5-27.4 months), with a median follow-up of 26.6 months (range, 16-38 months). A confirmed objective response occurred in 12 patients (9.6%; 95% CI, 5.1%-16.2%), including a complete response in 1 patient (0.8%) and a partial response in 11 patients (8.8%). The 1-year progression-free survival rate was 10.2% (95% CI, 5.4%-16.7%) and median overall survival was 11.2 months (95% CI, 8.7-15.4 months). Infusion-related reactions occurred in 25 patients (20.0%). Other frequent treatment-related adverse events (any grade event occurring in ≥10% of patients) were fatigue (17 [13.6%]), diarrhea (15 [12.0%]), and nausea (14 [11.2%]). Grade 3 or higher treatment-related adverse events occurred in 9 patients (7.2%), of which only the level of lipase increased (3 [2.4%]) occurred in more than 1 patient. Twenty-one patients (16.8%) had an immune-related adverse event of any grade. No treatment-related deaths occurred. Conclusions and Relevance Avelumab demonstrated antitumor activity and acceptable safety in heavily pretreated patients with recurrent or refractory ovarian cancer. In this large phase 1b study, avelumab showed antitumor activity in patients with heavily pretreated recurrent or refractory ovarian cancer that progressed after platinum-based chemotherapy (28 patients [22.4%] received avelumab as fourth-line treatment and 22 [17.6%] patients received avelumab as fifth-line treatment). The ORR was 9.6% and responses were durable (median, 10.4 months). Results of biomarker studies suggested that neither PD-L1 status nor BRCA status was associated with response, which is a novel finding. Very few patients had tumors with high-level PD-L1 expression, which is associated with an increased probability of clinical benefit with anti–PD-1 or anti–PD-L1 treatment of non–small cell lung cancer.38-40 Of 2 patients who had clear cell carcinoma, which is known to be chemoresistant, 1 patient had a PR and the other had an immune-related PR. The overall disease control rate was 52.0%, the 1-year PFS rate was 10.2%, and PFS appeared to plateau out to 2 years, consistent with prolonged response or disease control in a subset of patients. Median OS was 11.2 months (12-month OS rate, 47.0%). In subgroup analyses, patients with less pretreatment appeared to have greater clinical benefit: in 19 patients with 1 or fewer prior lines of treatment for locally advanced or metastatic disease, the ORR was 21.1%, the 12-month PFS rate was 15.8%, and the median OS was 16.1 months. Avelumab also showed an acceptable safety profile, including a low rate of grade 3 or higher treatment-related AEs (7.2%) and immune-related AEs of any grade (16.8%). We were unable to draw conclusions about whether response was more likely in patients with immune-related AEs because of the small number of patients and the confounding effects of treatment duration, although this concept has been investigated in a larger cohort with various tumors using a dedicated statistical method.41 Overall, our data provide the rationale for further studies of avelumab in ovarian cancer. This study had some limitations. Interpretation of the findings is limited by its early-phase, single-arm design. Assessment of BRCA status was not mandatory and data were available in only a minority of patients. In addition, the limited number of responding patients hampers any analysis of patient or tumor characteristics associated with response. Although response and survival findings with avelumab monotherapy in this study are encouraging, it would be of interest to determine whether efficacy can be increased through combination or sequential regimens involving chemotherapy or PARP inhibitors. Two global phase 3 trials of avelumab in combination with chemotherapy have been initiated in patients with ovarian cancer. JAVELIN Ovarian 100 (NCT02718417) is a 3-arm trial comparing first-line carboplatin and paclitaxel chemotherapy given in combination with avelumab or given alone with or without avelumab maintenance therapy. In addition, JAVELIN Ovarian 200 (NCT02580058) is a 3-arm trial comparing avelumab or pegylated liposomal doxorubicin chemotherapy given alone or in combination in patients with platinum-resistant or platinum-refractory disease who have received 3 or fewer prior lines of therapy for platinum-sensitive disease and no prior systemic therapy for platinum-resistant disease.46 Several early-phase studies have been initiated combining anti–PD-1 and anti–PD-L1 antibodies with PARP inhibitors, including a phase 1b/2 trial, JAVELIN PARP Medley, which is enrolling a cohort of patients with recurrent platinum-sensitive ovarian cancer who will be treated with avelumab plus talazoparib (NCT03330405). Results from these ongoing studies will help to define an appropriate role for checkpoint inhibitors within the treatment of ovarian cancer. Reageer op "Immuuntherapie met avelumab, een anti-PD medicijn blijkt veilig en geeft hoopvolle resultaten bij patienten met zwaar voorbehandelde vergevorderde eierstokkanker"